Kris Aquino apologized to Derek Ramsay since she would be unable to star in the movie that she previously described as an "adult relationship drama." 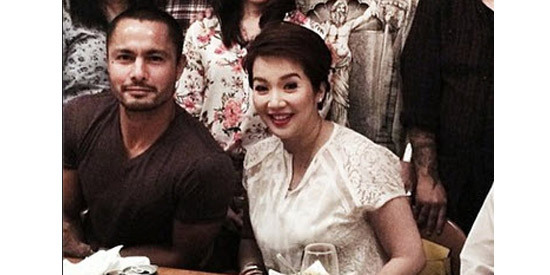 Kris Aquino has not been allowed to do a movie with TV5 star Derek Ramsay. The TV host-actress announced this during the April 12 episode of her morning show, Kris TV. On air, Kris apologized to Derek, saying that she would be unable to star in the movie that she previously described as an "adult relationship drama." Kris was talking with Sunshine Cruz when the name of director Erik Matti was mentioned in their conversation. "Speaking of Erik Matti, nakausap ko si Tita Cory Vidanes and I was told, 'You tell Regal hindi pwede.' So yun na. So, I apologize. Derek Ramsay, I'm sorry. I'm obeying my boss," said the ABS-CBN star. Two weeks ago, Direk Erik previously met with Kris and her manager Boy Abunda regarding the said movie project. In her Instagram account, Kris expressed hopes that she would be allowed to star in the movie that would have been produced by Regal Entertainment and Reality Entertainment. "Boy & I were rushing to A&A Wednesday night, we taped & I forgot to upload. Here's hoping the movie project (an adult relationship drama about going with the flow of love after mutual failed relationships) w/ @ramsayderek11 to be directed by Erik Matti pushes through. Roadblocks? Tight shooting schedule, readiness of the script & most importantly approval from my boss @cvvidanes, right @montie08?" This marks the second movie project of Kris and Derek that did not push through. Last March, Kris revealed that she turned down a movie project with Derek because of her busy schedule. This indie film titled Maratabat (Dangal at Katarungan) was written by Arlyn dela Cruz. In her caption, Kris pointed out that "it would have been memorable to share the screen with Derek." "I was offered a beautiful, moving & powerful material for an indie film slated to join the Barcelona Film Festival. Last year I was offered an excellent role but it required me to shave my head. Over the weekend @ramsayderek11 called me because he had spoken w/ Ms Arlyn & he loved her pitch & wanted to connect us because the project felt like a worthwhile challenge. Boy & I met w/ her last night & her script was superb. Unfortunately the movie's production timing is immediate & there's no way to juggle my schedule to make shooting possible... I am extremely grateful to have been considered & it would have been memorable to share the screen w/ Derek... Hopefully another opportunity will come. Best of luck to Maratabat!" Jun Lana initially offered the lead role of Barber’s Tales (Kuwentong Barbero) to Kris. When she turned it down, the role went to Eugene Domingo who earned the Best Actress award at the 26th Tokyo International Film Festival for her performance.